Ever since Indian advertising discovered the magic of long format storytelling, the digital audiences have been treated to a plethora of heart warming stories. The 30-second TVC gave way to longer versions for the socially connected consumers, and what we got were 2 to 7 minute long video stories that helped build the brand image one video at a time. While Indian brands have mastered the art of visual content marketing, they are now in the phase of video marketing for an enhanced, continuous form of brand storytelling. While 2014 was the defining year for long format ad films, this year began on a new journey in the space of long format Indian ad films. 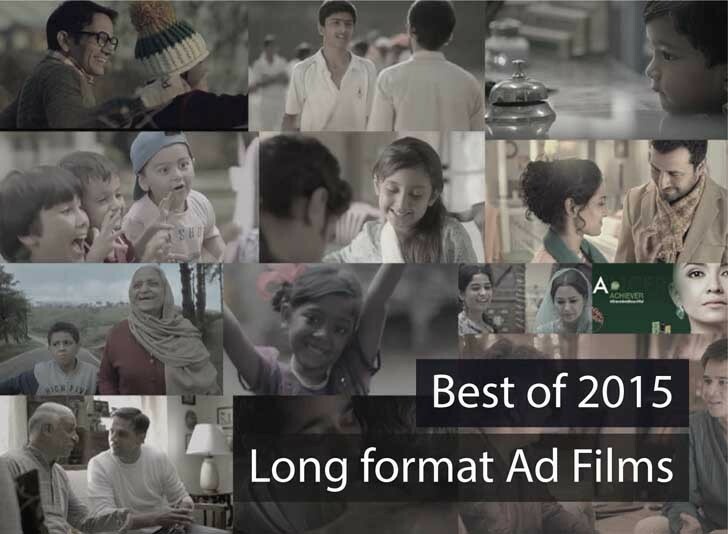 From Insurance to FMCG, Technology and Ecommerce, many brands adapted themselves to the digital world this year, and told their stories as long format videos, not as advertisements. The product either took backstage or was weaved seamlessly within the story. Birla Sun Life Insurance (BSLI), the life insurance arm of Aditya Birla Financial Services Group rolled out a moving story of a single father’s grit and determination in raising his autistic son. Conceptualised by Taproot India, the 3.5 minute film titled ‘Khud ko kar buland’ shows a father going through one life trial after another but always managing to take care of his son’s dreams as well as his own. The film ends with a rather poignant message of protecting your loved ones as well as your dreams, given the unpredictability of life. Read all about the Birla Sun Life Insurance ‘#KhudKoKarBuland’ campaign. In a move to promote its home healthcare products, medical equipment maker, Omron rolled out a long format digital film titled ‘Tumhaari Amma’. The 6.46 minute film conceptualized by Dentsu Marcom, takes a slice out of the beautiful relationship between this city working daughter and her small town mother, and their role reversal. It begins with the mother receiving a letter from her worried daughter – in which she’s been addressed as ‘beta’ – telling her to check her BP and also about a new man she has found through a matchmaking portal. Read all about the Omron ‘Tumhaari Amma’ campaign. For Wagh Bakri Tea, its strong taste was the centre of all brand communication until this year. The brand has been looking to soften its image to focus on the beauty of relationships with the tea acting as a catalyst. A 4-minute film was conceptualised by Scarecrow Communications called ‘Rishton ki Garmahat’ or the ‘warmth in relationships’ featuring a husband and wife rekindling their relationship over a cup of tea. Read all about the Wagh Bakri Tea ‘Rishthon ki garmahat’ campaign. Hair care brand, Dabur Vatika made many heads turn with the launch of its long format ad film, ‘Brave and Beautiful’. The ad campaign paid a tribute to woman cancer survivors by featuring a young mother reclaiming her regular life post cancer. A 4-minute film was conceptualised by Linen Lintas and produced by Film Farm, where the protagonist is a bald woman who has survived cancer and is now back to regular life at home and her workplace. Read all about the Dabur Vatika ‘Brave and Beautiful’ campaign. For Anouk, Myntra’s contemporary ethnic wear brand, the fashion etailer rolled out 3 3-minute films, each broaching up social acceptance issues around women. The three films in the campaign ‘Bold is Beautiful’ focussed on issues like ‘homosexuality’, ‘single-parenting’ and ‘staying single’. The most viral, ‘The Visit’ is the story of a lesbian couple who had been hiding about their relationship with their parents, and now plan to reveal it. Read all about Myntra Anouk Bold is Beautiful campaign. ‘The Calling’ featured actress Radhika Apte as this high performing architect who isn’t being promoted despite having worked nights on the project. This discrimination started from the time she had gotten pregnant, but victory is hers at the end. She walks away from the job and starts up on her own. ‘Daddy aur Zooey’ is Tata AIA’s attempt at telling an endearing story of a father and his son Zooey. Here the daddy is not the conventional superhero – he is pushed around in queues or gets entangled in blankets – but makes up for it nevertheless, and is quite adorable, as is his son. The 4-minute ad film conceptualized by JWT tells the story of their unique relationship, while stressing on how we live for the good of our dear ones, in line with the insurance brand’s recent rebranding around ‘Making good happen’. Read all about the Tata AIA DaddyAurZooey campaign. OLX India, one of India’s largest online marketplace for used goods launched an amazing social media-driven initiative called #Daastaan, ahead of the Independence Day of two nations separated at birth – India and Pakistan. OLX invited people to share stories and memories of belongings that were left behind during the massive migration on its Facebook page, and the brand promised to help search their rightful owners. A 3-minute story depicts how Ram Prakash Khullar was reunited with his father’s camera through the initiative. Read all about the OLX India #Daastaan campaign. HUL got a little imaginary girl named ‘Chamki‘ to convince her mother to wash her hands with soap, to prevent infections for its latest campaign. This was the second in the series of HUL’s 2013 award-winning campaign for Lifebuoy ‘Help a Child Reach 5’. The 2.5-minute ad film conceptualised by Lowe Lintas, begins with hard-hitting stats – 6 million children die before they reach the age of 5, followed with a real life experiment with to-be mother named Sangrahi, and her imagined daughter Chamki. Read all about Lifebuoy ‘Chamki’ campaign. This Independence Day, OYO Rooms, India’s first technology driven branded network of hotels, rolled out a 6 minute digital film, ‘Jai Hind’ featuring actors Manoj Bajpai and Raveena Tandon. The video pays tribute to Independent India and the freedom fighters of the country but does so in a way you could never have imagined. Paper Boat launched its first multimedia campaign in sync with its brand philosophy of ‘Drinks and Memories’. The idea of the campaign was to take viewers on a trip down memory lane and into their childhood. The 3.35 minute ad film created by Karishma Lintas, documents the tiny sagas of growing up, that all starts with a little paper boat floating down the river of memories. The touching poetry rendition by Gulzar and the background score of Malgudi Days greatly helps the storytelling. Online furniture store, Urban Ladder has rolled out a 7.16 minute long film called ‘The Homecoming’ in which the furniture brand plays a key role in bringing two generations of a family to stay together. Starring Piyush Mishra as the father and Tapsee Pannu as the daughter-in-law, the film takes one through a typical family story where the older generation is reluctant to move in with their children, as they are so used to the furniture back home. Read all about the Urban Ladder “The Homecoming” campaign. This Diwali, Asus India rolled out the ‘Har pal Happiness’ Diwali video as part of its campaign of the same name. Capturing a snippet from the life of one father and son, the 3-minute film takes us through their unexpressed emotions of love and understanding through the festival of Diwali. While the son makes use of the remuneration from his tuition classes to buy his dad a much needed spectacle, the dad buys him a brand new laptop from his savings and Diwali bonus. Read all about Asus India “Har pal Happiness” campaign. When online travel agency MakeMyTrip introduced ‘uncancel’ – a first-of-its-kind feature that allows users to make the same trip they had cancelled, at a later point of time within the same initial budget, it took help of a long format ad film to promote it. The 3.45 minute ad film created by FCB Ulka tells the beautiful story of a son who is about to meet his dad for the first time and how a cancelled ticket does not foil his plans. Read all about the MakeMyTrip ‘Uncancel’ campaign. Online classifieds site, OLX began shifting focus on the real value of its platform based on user insights gained over the last four years. The new campaign, ‘‘Keemat Bhi, Kuch Keemti Bhi’ was driven by the deeper benefits experienced by the buyers and sellers on the platform. As part of the campaign, the brand had launched a 4-minute film portraying a beautiful transaction of a cricket bat from one passionate cricket player to another promising cricket player. Read all about the OLX #LetWhatYouLoveLive campaign. HDFC Life chose to depict the beautiful relationship of a father and daughter, with an inspiring twist. The life insurance brand had launched #MyFamilyMyPride focussing on family pride and how important it is for a father to instil a spirit of independence into his children. Conceptualised by Leo Burnett, the 3-minute film features a heart warming story of a father and his daughter who dreams of being a dancer. The father here isn’t pampering his daughter with everything the world has to offer, but makes her stand on her feet, literally. Read all about the HDFC Life ‘#MyFamilyMyPride’ campaign. “Chhoti Khushi” by Sony LIV tells the story of two brothers who love each other but have been living apart after some small fights. Their complex relationship is explored in the backdrop of Diwali and how the festival becomes a catalyst in bringing the two together. Titled “Choti Khushi”, the 6.35 minute film is being called as a ‘story of togetherness, erasing judgments, and staying in the moment; it’s a story about two brothers shredding their egos on a special day’. During the ICC World Cup, Gillette chose to celebrate Indian cricket fans by dedicating a video for them. Created by Grey India, the 4-minute film captures the journey of a unique Indian cricket fan right from the advent of one day cricket till date, taking viewers through the transition of cricket – from traditional white clothing and red balls to the day and night format characterized with coloured clothing, floodlights and white balls. Read all about the Gillette India ‘The best a fan can get’ campaign. Eicher Trucks & Buses had an important message weaved into its Diwali film – this Diwali, the motor brand sought to discourage drunk driving through its video campaign “#YaaronKiDiwali”. Themed around ‘Roke Wahi, Jo Yaar Ho Sahi’, the 5.12 minute film is a beautiful tale of friendship among truck owners who take care of each other, and not let any one of them drive drunk on the highway. This Father’s Day, Oyo Rooms focused on the special bond shared by dads and sons – one where both shy away from verbally sharing their love. The 3-minute video conceptualized by Boring Brands, starring actors Piyush Mishra and Zeeshan Ayyub, tells you to express your love and value the relationship while it is still present, by weaving a mischievous yet adorable story. The text blurb at the end goes, “For the man who took your dreams to places. Now it’s your turn.” The campaign also involved a #Dadsmash Dubsmash contest where one to create dubsmash videos dedicated to their fathers. Lufthansa India began spreading Diwali cheer this festive season, the German carrier offered to fly you to the one you love, through its Lufthansa Diwali Surprise campaign. All one needed to do was send a Diwali wish at the microsite, and keep their fingers crossed. A 3-minute film was launched as part of the campaign, featuring an adorable grandpa missing his granddaughter who’s in Canada. Abbott rolled out a 2-minute digital film ‘Dreams have no age limits’ as part of its global campaign #Fullosophy, where the brand is enabling people to live to the fullest. The film features this playful, healthy dadi who wants to ride the bicycle but her grandson has punctured the tyres, fearing she will fall and get hurt. He is seen making all kinds of creative excuses while dadi doesn’t buy any of them. Finally, she is seen taking off on the bicycle and enjoying the ride to the fullest. Read all about the Abbott #Fullosophy campaign. Kissan brought another long-format film as part of Kissanpur, the ketchup brand’s three-year-old initiative to get people to discover the joys of nature and real togetherness. The idea of Kissanpur stemmed from the fact that today’s kids spent more time indoors and only interacted with their gadgets and digital devices. The new 3.25 minute film is an adorable one featuring an old man and many kids. The old man triggers a chain of events that ultimately brings together everyone from the building complex. Read all about the Kissanpur digital campaign. eBay India had rolled out a long format digital film to explain what exactly is ‘refurbished’ category, using storytelling. The idea was to establish that refurbished is equal to ‘as good as new’. The 2.40 minute film featured this father and son, who share a strong bond of love, but never show it in their talks. The son loses his laptop and is scolded for that, later the father loses his mobile and realises anybody can be careless. The film ends with the son buying himself a laptop and his father a mobile from the refurbished category, in the same budget. Read all about the Ebay ‘As good as new’ campaign.